Amazing features of the product Know more about the process and the product straight off. Talentpool helps you follow your time tested processes. Design multiple standard requisition approval workflows for different types of requisitions raised within your organization. With Talentpool’s requisition approval process, hiring managers can simply create positions using the standard position templates for requisition approvals. Talentpool gives you access to tools that help you manage multiple sourcing activities, including marketing campaigns, to gain access to more candidates. Starting with resumes from walk-ins, job fairs, internal job posting applications to multiple other sources - now take charge easily. Import candidate resumes from job portals directly into your centralized database. 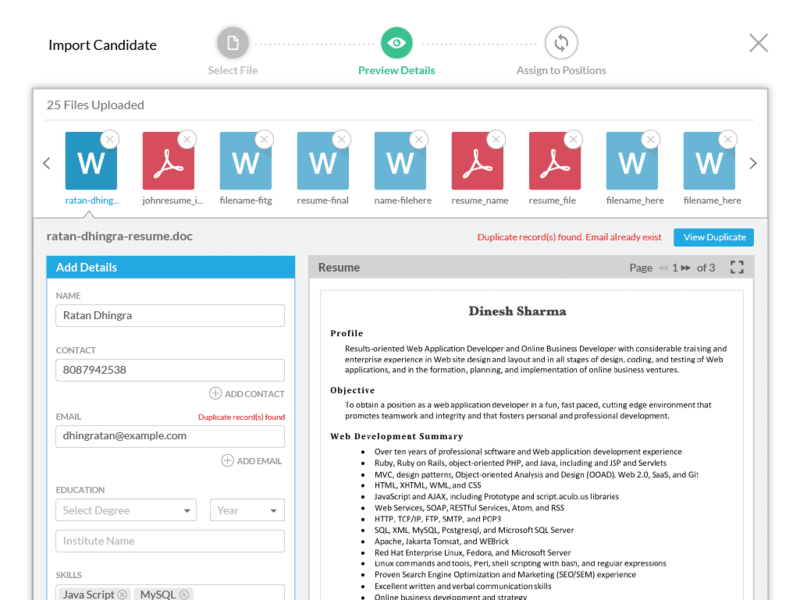 With Talentpool’s Portal plug-in, you can capture single or multiple resumes in a few clicks. Receive resumes from other sources like email, web pages, excel sheet or file & folders on desktop. Talentpool enables you manage your preferred vendors with ease. Reduce time spent by your recruiters on candidate status update. Publish selected positions to preferred or all vendors, allowing them to submit and track their candidates status. Encourage your employees to refer their friends or relatives. Publish position details on the Employee Portal and let your employees submit and follow their candidate progress through recruitment stages. Most of your potential candidates are browsing through the internet and are looking at your career website. Set up your career website to add, edit or readily remove positions as and when required. Integrate Talentpool and add resumes directly into the database without any manual intervention. It also enables you to tag candidates automatically to specific positions. So when a candidate with the right skills applies for a position, the resume gets shortlisted and is visible to your hiring manager for further screening. Use Talentpool’s advanced duplicate detection system to set criteria to identify potential duplicate resumes so that your database remains clean. Find relevant candidates quickly and accurately with Talentpool’s powerful yet easy-to-use search engine. Search through resumes in word, html, rtf and text formats based on actual years of experience, location, skills, educational qualifications or any other keywords. Nurture passive candidates to build a pool of interested candidates. Keep them informed about the developments in your organization through newsletters, event notifications and job alerts. Create a talent community which in turn brands you as an employer of choice. USe Talentpool to wish your candidates on birthdays & work anniversaries and send personalized mailers and stay closely connected. You can indulge in more meaningful interaction by sharing personalized job alerts and newsletters as per candidates’ domain, experience and skill sets. Hiring Managers want the new hire! They hardly want to spend time defining and refining the hiring process. Help them minimize time and efforts with position templates which have job description samples, ready skill sets to choose from and structured feedback templates. Provide them real-time visibility with roles based dashboards and standard reports. As soon as the interview is scheduled, interviewers and candidates receive a calendar request. Post the interview, the interviewers receive a feedback reminder. Interviewers can submit their feedback through their mobile devices as well, using the Talentpool Android app. With Talentpool’s automated to-do list, stakeholders do not miss on their tasks. The turn-around time does not take a hit any more because hiring managers missed their emails. Tasks are generated for each responsible user and every stakeholder has visibility into the progress as well as bottlenecks of the hiring process. With Talentpool you no longer need to juggle with feedback excel sheets and emails. 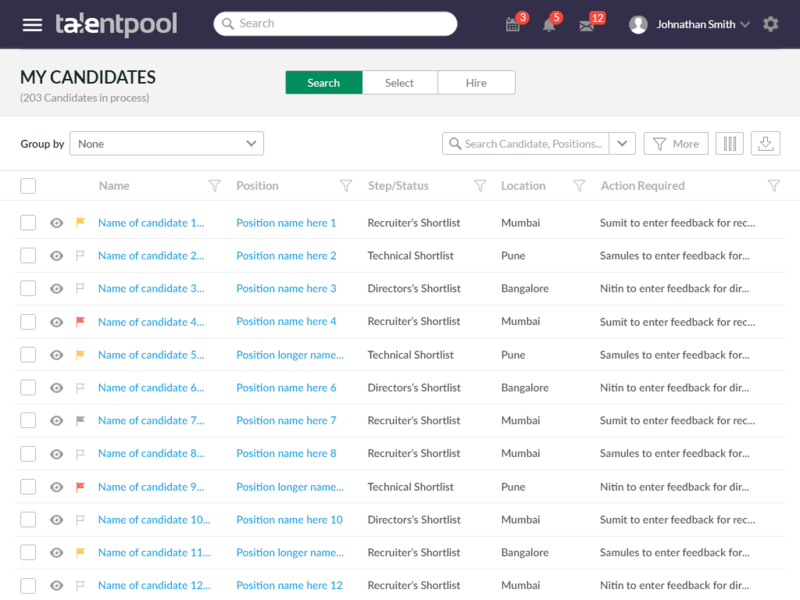 Now collate and maintain information for each candidate and every step of the hiring process in Talentpool. You can retrieve information whenever you need to refer to any candidate or position. With structured feedback templates, now you can define the exact parameters that you want candidates to be evaluated on for various positions. Recruitment is no longer based on subjective feelings but consistent and standard assessment parameters. Talentpool helps you generate offers letters in minutes. Define salary components and salary structure in the system to compute salary sheet. Get the required approvals through the system to ensure smooth progress. You can also limit the access to these modules based on roles. 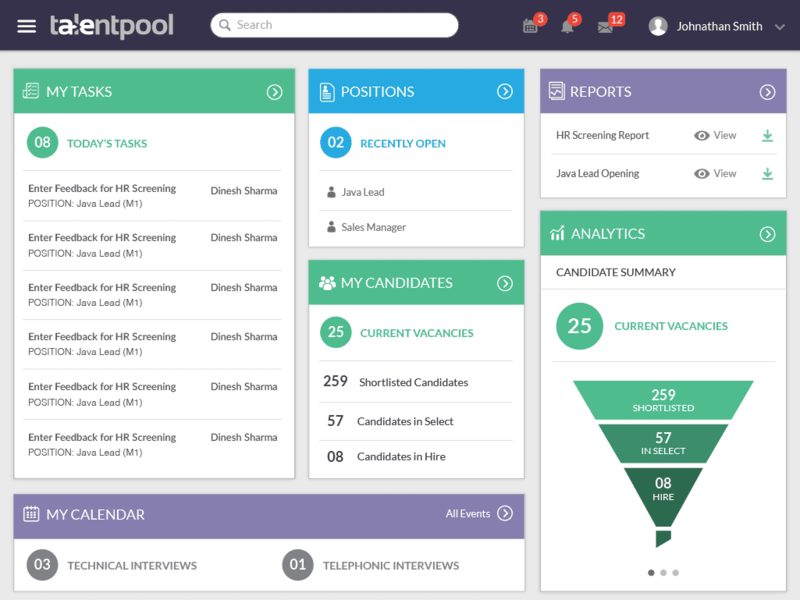 Talentpool streamlines recruitment and brings in transparency. Candidate Management module, Communication History, Dashboard and Reports help you track the efficiency and effectiveness of the overall process. These features also help you track key information areas such as source efficiency, locations, candidate demographics, recruiter efficiency, TAT influencers and much more. Track overall or position wise recruitment expenses using Talentpool’s budgeting facility.